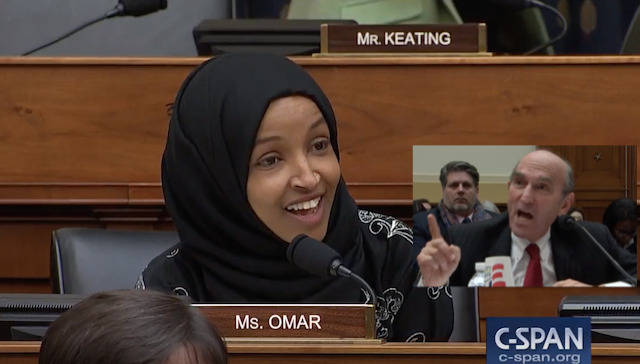 Rep Ilhan Omar just gave a perfect demonstration as to why she does not belong on the House Foreign Affairs Committee, let alone in Congress, as she launched a vicious attack against Elliot Abrams, US special envoy to Venezuela, during a hearing on the crisis in Venezuela. Regardless of what your opinion of Abrams is, fact remains he was pardoned for his involvement with the Iran-Contra affair. For this monster Omar to attack and not permit Abrams to give a response is despicable. This is what happens when democrats run a committee and people better get used to it. Just think we have two years of this. Chuck and Nancy must be so thrilled to have these loose cannons being the face of their party! If they wised up they would remove them from committees, keeping them in a corner but I guess they don’t want to win in 2020 and that’s just fine with conservatives and Normal Americans! By all means keep Omar and company in play to attack witnesses, make anti-Semitic comments and present proposals that are based in fantasy land that will destroy the US.